The opposite of “magnum opus”? a work of art, music, or literature that is regarded as the most important or best work that an artist, composer, or writer has produced. Does there exist an opposite term (in the sense of the least important or worst work ever produced by someone)? 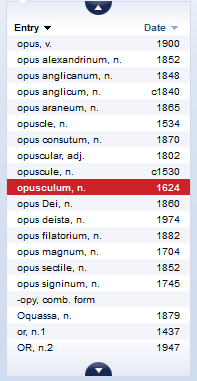 Accessible list: opus; opus alexandrium; opus anglicanum; opus areanum; opus consutum; opus deista; opus filatorium; opus magnum; opus sectile; opus signinum. Thesaurus.com doesn't list a specific antonym. So: make one up. I don't know whether parvulum is widely understood, but it appears in some macaronic Christmas carols, and using a phrase which is similar to magnum opus might give the general idea. You might take a cue from theater reviews. There are so many epic failures (e.g., Damon Lindelof, Prometheus) that reviewers have to come up with new ways to describe them. There are some relevant terms, though I don't know if any are as superlative as magnum opus. Possibly this is because we don't usually concern ourselves with relative degrees of failure or insignificance. A small or minor literary or musical work. That's very close to the opposite of a masterwork, and even has opus in it, but it's not at all a commonly used term (ODO notes that it is rare). King Stephen is one of Beethoven's minor works, and only its overture is performed with any frequency today. Works produced by an author or artist while still young. But there is also often an implication that such works are, themselves, somewhat immature, produced before the artist had achieved full mastery of their art. It also has the benefits of being both Latin and at least somewhat familiar. If you are open to more creative language uses, marginalia in it's extended sense of "nonessential items" (M-W) might be stretched even further to cover an artist's nonessential or marginal works, borrowing a bit of literary cred from its similarity in sounds to the above-mentioned juvenilia. Or for a very creative choice, I will note that my auto-correct keeps suggesting magnum oops. The word "minuscule" can be used as a noun or an adjective. By chance could it be Parvum Opus? Which basically means a minor work —not necessarily bad, though. (of a performer or show) be completely unsuccessful; fail totally. "the show flopped in London"
The show was a total flop. This is usually in regards to ticket sales or popular opinion. Even if a show or artwork's critical acclaim is high, it can still be a flop. The solution doesn't have to be Latin-based, it can be comprehensible, in English, and idiomatic sounding. Not the answer you're looking for? Browse other questions tagged vocabulary antonyms or ask your own question. What is the opposite of “interesting” in “This person is interesting”? What's the opposite of “extending the deadline”? What is the 'opposite' of ekphrasis?